Vintage cars and motorcycles are more than a market – they are a passion. Cars collector are becoming increasingly known as a “passion investor”, demonstrating just how the venture draws strength from a love for design and all that is vintage. The maintenance of such vehicles is extremely important. Hence, to protect one’s investment, selecting the right battery is paramount, given that the performance of the vehicle goes hand-in-hand with the protection of its value. The TOP ENERGY 6V batteries offer excellent versatility. They satisfy the needs of vintage cars, whilst also being suitable for stationary use and light traction. 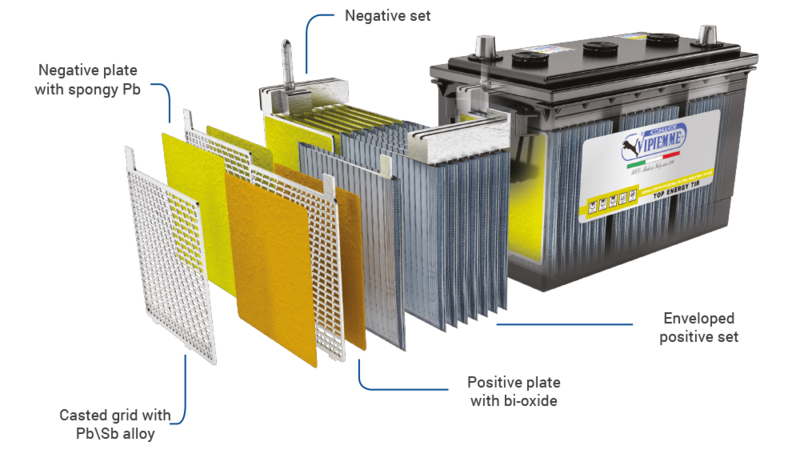 They are characterised by a high degree of reliability and resistance to vibrations, thanks to an effective plugging of the plates in the cells and the use of microporous polyethylene separators. This permits a high mechanical resistance to vibrations, with a consequent guarantee against internal short-circuiting. The grids, built with Pb/Sb alloy technology with low antimony content, drastically reduces water consumption. Other features of the accumulator are the excellent charge acceptance and the high corrosion resistance of the positive electrodes.